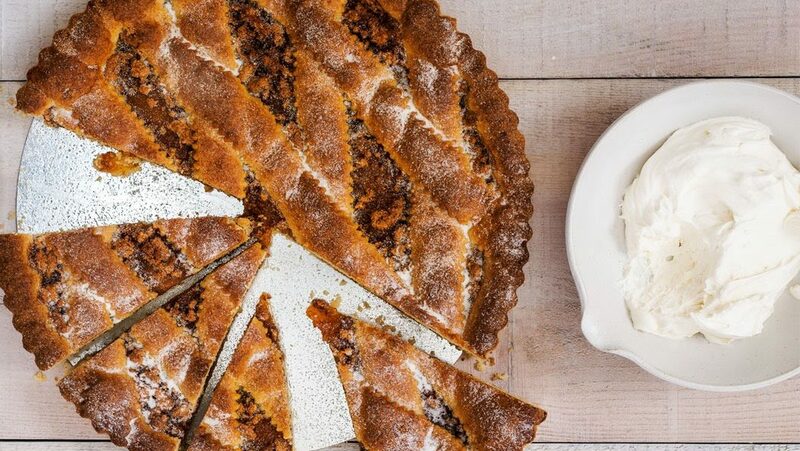 The Chiappa’s family friend, Anna, whips up a delicious Apricot and Amaretto Tart (Crostata) that takes the girls right back to childhood. Sometimes the best dishes aren’t written down, but instead come from the heart. MIX the butter and flour in a large bowl, until it resembles fine sand. It’s important that the butter is at room temperature to achieve a smooth consistency. ADD the egg yolks, sugar, lemon zest, vanilla essence and baking powder mixing until well combined and starts to form a dough. COVER with cling file and rest in the fridge for 30 minutes. ROLL out the remaining pastry until it’s 0.5cm thick and large enought to line the prepared tin, ensuring the base and sides are completely covered. (If it’s a little crumble, just push any stray pieces of dough into any gaps when you’ve lined the tin). SPOON the jam into the pastry case and spread to form an even surface. Fold over any excess pastry around the sides to create a 2cm border. SPRINKLE the amaretti/rum mixture on top of the jam. ROLL out the remaining quarter of the dough and cover the tart. Brush with a little milk and sprinke with brown sugar. BAKE in the oven for 30-40 minutes, until the pastry is golden brown.